Some of the best memories I have as a child is the fun sleep overs at my grandparents’ place. Nanna would spoil us with a yummy dinner followed by ice cream sandwiches, literally ice cream squished between two wafer biscuits. Never will I forget the packets of lollies, (typically the natural confectionary snakes) she would hand us at the end of our sleep over. I can also remember the times that she would read us a bedtime story and my Pa would act out some of the characters’ voices and make me giggle in delight to no end. These are cherished memories that I won’t forget and now looking back, I realise how lucky I was to have been exposed to such a rich experience using books, stories and language. And now as an aunty, I try to read to my niece as often as I can as I love reading story books with her and enjoy that special time together. For those of you who have kids, grandkids or nieces and nephews of your own, I’m sure you’ve heard it said many times that you should read to your kids from a very young age as it helps with their learning and development. As a Speech Pathologist, I give this advice to parents often so that they can help develop their children’s early language skills. However, the common responses I usually receive from parents is that they say things like “he/she gets bored”, “they can’t sit still and listen to the whole book” or “he/she won’t answer questions when I ask them about it”. Does this sound like your children? Or some parents are worried that they’re just not sure HOW to read to their children and make it fun, interesting and to help them with their language development. Fear not! You’re not the only one! Sometimes for little children, sitting through a whole book and listening to the story is just too hard, and reading to children can be quite an “art form” in some cases. But don’t worry, there are plenty of ways to use picture books to help your child understand and learn language, without having to read it cover to cover while also making it enjoyable and not feel like a chore. Reading picture books to young children has multiple benefits for both you and your child. You have quality time that you get to enjoy with each other. Reading can help develop children’s love for books and will help to increase their imagination skills. Story books can often be a springboard into helping children learn their letters, sounds and some basic written words. For younger children, picture books are a great tool to help children develop early language skills, particularly for children who are ‘late talkers’, but also kids with typically developing or advanced language skills. By modelling language for children to hear whilst showing them the items in a book, it allows them to more easily link meanings to words. Although most picture books that are targeted at the younger ages are quite short stories already, you don’t have to read a story from beginning to end if your child isn’t up to sitting through a whole book. Picture books can be used to target multiple areas of language with even just a few pages, and you can work on a variety of goals depending on your child’s needs. 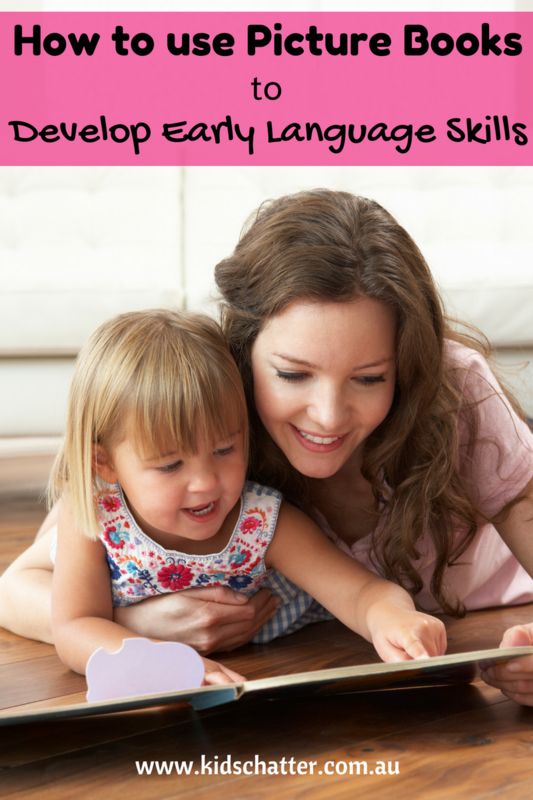 So below are 8 different ways that picture books can be used to help develop your child’s early language skills. Children need to learn words to be able to label things around them and refer to them by the words we all know. Using pictures is a great way to do this as we don’t always have every type of object around the house to teach kids using the real item, so this is where pictures are great. In the book, point to items/objects on the page and label them for your child to hear. Tell them the names of the animals and also talk about the different sounds they make. For example, say “Look, can you see the cow? There’s the cow. Cow. The cow says moo”. See if your child can say the word “cow” and if they can’t, get them to imitate the sound it makes (moo). This is great to do with children who are late talkers or those who are just learning to talk. Showing items and labelling the picture with spoken words can help children connect the picture/object with the word. If you are modelling new words, make sure you REPEAT REPEAT REPEAT. Say the word multiple times for children to hear. Repetition is key to learning these new words. Who has heard the rule “every sentence has to have a verb” when growing up? I’m sure most of you would be familiar with this. And it is true! Every complete sentence has to include a verb (action word) for it to be considered a sentence. However, verbs are the types of words that a lot of parents don’t always think to model to their kids. It’s easy to tell them the words of things (nouns), but the verbs are often neglected. And to help children move on from saying single words to using 2 – 3 word phrases, they need to become familiar with using verbs in their vocabulary too. Use your picture books to teach your child verbs. The characters in the story are always doing something, so label the actions for your child to hear and if possible, model the actual action too. For example, you could point to the picture and say “baby is clapping, clap, clap, clap” and then model the action for your child to see and for them to copy. This will help your child to learn early sentence structure like noun + verb such as “mummy eat”, “daddy kick”, “boy is swimming”. Drawing attention to lots of action words will help your little ones increase their use of phrases and sentences. Children’s picture books are often very visual and colourful with lots of details in the illustrations. You can use these pictures to label and model the things/items and use lots of describing words. Describing words can include things like colour, size, shape etc. For example, when pointing to a picture of a cat you can say “Cat! He has black fur, he is so fluffy. Look at his pointy ears and long tail”. Children learn language through listening to others, so the more you model your language with lots of describing words the easier it will be for your child to use describing words in their own language and also increase the length of their sentences beyond just single words. In this video, Speech Pathologist Monique Speakman goes through some examples of how to use picture books to help with early language development. Click here to buy your own copy of the Where is the Green Sheep book. This means we can use picture books to talk about the function of an object – how is it used or what is it used for? We can name the objects on the page and talk about them, for example, “soap – that’s for getting nice and clean”, “gloves – they keep our hands warm when it’s cold outside”, “clock – that tells us the time”. Being able to identify objects and understand what they are used for makes it easier for children to understand what the items/objects are and why they need them. Picture books are great for developing children’s understanding and answering of questions. Ask questions relating to the objects or characters within the book. We can vary the questions (who, what, where, when, why and how). For younger children aged between 1 – 2 years, ask more simple questions like “what is that?” or “where is the sheep”? As children get older (3 – 5 years of age) they begin to understand more complex questions like “why is he running away?”, “how do you know the duck is feeling sad?”. This will help to expand your child’s knowledge of positions/locations using where questions, or cause and effect using why and how questions. Picture books are a great way to practise answering different questions. If this is your goal, pick a book that has a couple of characters (both boys and girls). Again, point to the picture and model the correct pronoun. For example, “she is a girl, she is brushing her hair”. “He is a boy, that is his room”. Remember to REPEAT REPEAT and REPEAT the words so children have the opportunity to hear it and learn it for themselves. How often do your kids ask you to read the same story over and over again? Kids often have their favourites and although you may be getting sick of reading it every night, it’s wonderful when children want to hear the same story as you know that they will be engaged and will listen to you. But what it also means is that each time you read it again and again, they learn something new that they may not have picked up on the previous times. So they are continuously seeing and learning new things because they can are so familiar with most of the story already, that they can take in different parts of the story with each subsequent reading of it. They don’t need to worry about a huge amount of brand new information that is sometimes too much for one little brain to absorb in just one time of hearing a new story. Repetition of the same story also creates the opportunity for your child to “fill in the blank”. You do this by reading the story and purposely leave out one word at the end of a sentence and wait for your child to tell you what that word should be. Take a nursery rhyme as an example; if you sing “twinkle, twinkle little……….” you know you that you just want to fill in the blank and say “star” (I bet you were singing the tune in your head too like I was!). You know the missing word because you’re so familiar with this nursery rhyme and for kids, it’s the same too, when they’ve heard it enough. Use this technique to get your child to use spoken words with predictable answers and help them grow their vocabulary and language. Once children are using lots of words, encourage them to make up their own stories. You can start with simply seeing if they can fill in the words of a story they know well, or finish off your sentence (fill in the blank as per above example). This encourages them to start using their own words and start creating their own sentences. Older children may be able to predict what is going to happen next in the story or create their own ending. So even after you finish reading the story, ask them “what will happen next?” There is no real right or wrong answer here as they can make it up, as long as their response makes sense based on the existing story. Another great task to practise creating your own stories, is to pick two characters out of the picture book and create a whole new story together. They don’t have to write the words themselves, but they could draw the pictures to create a new book and have your child tell the new story to other people in your family. Or they can use soft toys such as this fluffy green sheep to create their own version of the story. There you have it! 8 different ways to use picture books to help develop early language skills and it doesn’t require you sitting down for ages reading cover to cover! Now that you know how to use a book to help develop early language skills, pull out those books from the shelves and give it a go. 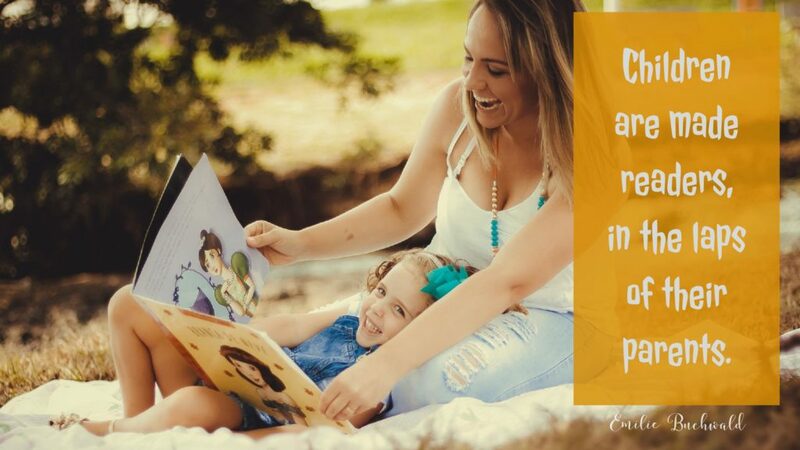 Remember, reading with your child doesn’t always have to be about completing the whole story, you can use the pictures to talk about anything and everything. Model lots of language for your child to hear and learn. 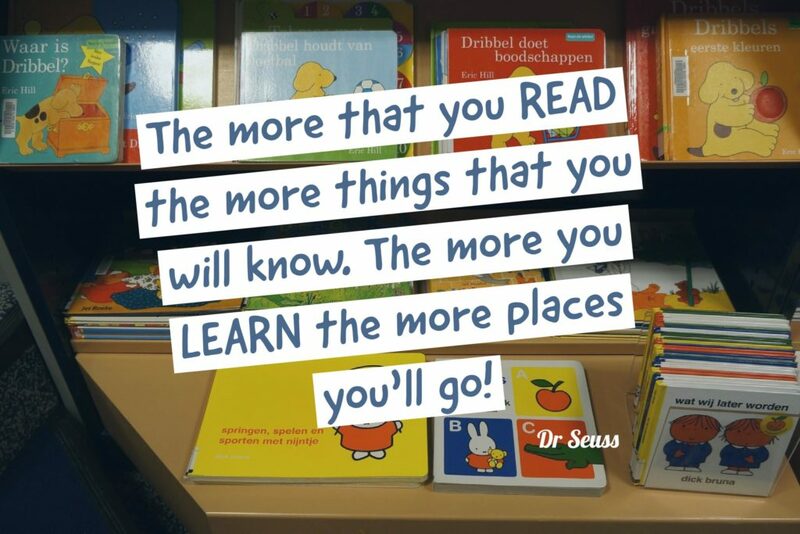 And most of all, when reading to your children, make it fun! Put on those funny character voices, make those silly faces and really engage your child. Happy reading! Have you got a favourite picture book? Please share what you and your kids love to read so we can all get to know new favourites to add to our collections! Sarah Hyam is a Paediatric Speech Pathologist in Brisbane and part of the Kids Chatter Speech Pathology team. 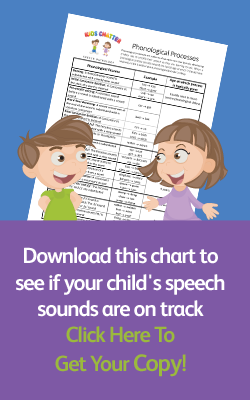 She aims to educate parents about child development and communication through the Kids Chatter Speech Pathology Blog and Facebook Page and to provide information and tips on anything to do with Speech Pathology. We are a participant in the Amazon Services LLC Associates Program, an affiliate advertising program designed to provide a means for sites to earn advertising fees by advertising and linking to Amazon.com. All opinions are my own.